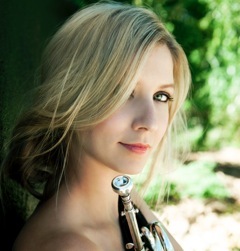 Classical Trumpeter and Gold Medal Global Music Award Winner Mary Elizabeth Bowden has been described by Gramophone Magazine as “brilliant” and “radiant in new repertoire for trumpet.” Bowden, a Yamaha Performing Artist, released her debut album, “Radiance”, on Summit Records featuring new American works in 2015. Bowden is the First Prize winner of the 2012 International Women’s Brass Conference Trumpet Competition. She has performed as a soloist with the Chameleon Arts Ensemble (Boston), Chamber Music Society of Central Virginia, Laredo Philharmonic Orchestra, Croatian Army Wind Band, Springfield Symphony (MO), Naples Symphony, Richmond Philharmonic Orchestra, San Juan Symphony, Springfield (OH) Symphony Orchestra and New Haven Chamber Orchestra, among several others. At The Banff Center in Alberta, Canada, she performed Vivaldi’s Concerto for 2 Trumpets with trumpeters Jens Lindemann and Ryan Anthony. She was also awarded the Public Prize from the 2009 Perrenoud Foundation International Music Competition. Bowden frequently performs in recital both in solo programs and in a duo with her husband, trumpeter David Dash. Bowden is a founding member of both Seraph Brass and the Chrysalis Chamber Players, a recipient of a Yale Alumni Grant. She has collaborated in chamber music programs at the Marlboro Music Festival, Lakes Area Music Festival, The Banff Centre, and at the Sydney Opera House under the baton of Håkan Hardenberger. She has served on the adjunct faculty of Virginia Commonwealth University and at The Curtis Institute of Music’s Young Artist Summer Program. An experienced orchestral musician, Bowden is currently Principal Trumpet of the Sarasota Opera Orchestra and the Artosphere Festival Orchestra. She has served as Principal Trumpet of New Zealand’s Auckland Philharmonia, the Daejeon Philharmonic in Korea, and with Seraphic Fire’s Firebird Chamber Orchestra. At the Lucerne Festival in Switzerland, she held the principal chair in Pierre Boulez’s performance of Mahler’s Symphony No. 6, which was released on CD in 2011. The Luzerner Zeitung described her playing in one word – “outstanding.” Bowden is also a member of the Richmond Symphony Orchestra and the Des Moines Metro Opera Orchestra. Recognized as a child prodigy, Dr. Catherine Lan made her first international debut at the age of eight, performing in Japan following her winning at the Junior Original Composition International Competition. Since then, she has performed in Taiwan, Singapore, Thailand, Canada, Mexico, France, and the USA. Dr. Lan has appeared as a soloist with orchestras including Northeastern Pennsylvania Philharmonic, Sinfonia of the North Shore, British-Columbia Chamber, Fifth Avenue Chamber, University of British-Columbia Symphony, Braddell Heights Symphony, Frost Symphony, Vancouver Symphony, Broward Symphony, Palm Beach Atlantic Symphony, and Edmonton Symphony at such prestigious venues as Carnegie Hall in New York, Orpheum Theater in Vancouver, National Concert Hall in Taiwan, Gusman Hall in Coral Gables, and the historical Victoria Concert Hall in Singapore. Dr. Lan has also concertized with Naples Philharmonic, Atlantic Classical Orchestra, Piano Galore Ensemble, Boca Raton Philharmonic Symphonia Chamber Players, Southwest Florida Symphony, Palm Beach Symphony, as well as Aspen String Trio, and distinguished musicians such as James Buswell. Her upcoming engagements include returning appearance in American Cathedral in Paris, soloist with Taoyuan New Philharmonic Orchestra in Taiwan, and debut recitals in United Kingdom, Switzerland, and Slovenia, as well as collaboration with the Henschel Quartet. Dr. Lan has been the winner of numerous competitions including Taiwan Classical Music Society Young Star Audition, University of Miami Concerto, the Duane Wilder Award for Excellence in Harpsichord Playing, the Vancouver Foundation Advanced Arts Study, the Shean Piano Competition in Edmonton, Golden Key International Honour Society Performing Arts Showcase Award, Canadian Broadcast Corporation National Debut, University of British-Columbia Concerto, Grand Prize of the Richmond Festival Gala Showcase Concert, and Yamaha prize from the nationwide Concours de Musique du Canada. Dr. Lan has been featured on Fanfare magazine, World Journal of New York, WLRN-Public Television “Beethoven & Mas” program, “Beethoven Universal TV” series, Becon TV “Live with Iris Ackers”, Fu-Hsin Broadcasting Station, and CBC Radio’s “Westcoast Performance” Debut series. Previous teaching appointments include Indiana University and University of Miami. Received her Bachelor of Music from University of British-Columbia, Master of Music from Indiana University (Bloomington), and Doctor of Musical Arts from University of Miami, Dr. Lan conducts master classes in the USA, Singapore, and Thailand, and serves on the faculty of Broward College and Palm Beach Atlantic University, performs with Steinway Artist, Tao Lin, as Duo Beaux Arts, and runs non-for-profit organizations as a founding member of Chrysalis Chamber Players and co-founder/artistic director of Beaux Arts Chamber Music Series in Naples. A native of Denver, Colorado, Meghan Brachle began playing the flute when she was six. She was awarded a full tuition academic and music scholarship to study at Loyola University New Orleans, where she received a Bachelor of Music degree in Performance. She completed additional studies at the University of Miami. Her teachers include Patti Adams and Christine Nield-Capote. As a young musician, Ms. Brachle performed with the International Youth Wind Orchestra in Killarney, Ireland, and also participated in chamber music festivals in Siena, Italy and Estes Park, Colorado. 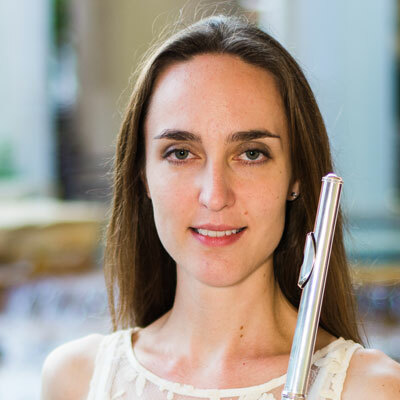 Ms. Brachle now resides in south Florida, where she has performed with the Naples Philharmonic Orchestra, the New World Symphony, the Boca Sinfonia, Symphony of the Americas and the Ars Flores Symphony Orchestra. She has performed alongside musicians such as Dame Evelyn Glennie and Anne Murray. She has been featured in solo and chamber music performances in recital venues around Florida, and with the Luzerne Chamber Players faculty recital series in Lake Luzerne, New York. She is co-founder of the Chrysalis Chamber Players, who in their first season earned a grant from the Yale Alumni Foundation. Ms. Brachle has also held administrative roles with the Southwest Florida Steinway Piano Society and the Dranoff 2 Piano Foundation.